The current situation in Egypt has been the second thing recently that has made newspapers feel like a ludicrously old-fashioned technology. The first, more trivially, was the cricket. England were playing in Australia, and because of the time difference, each day’s play was starting just before midnight and running until 7.30am — optimally designed to mess with the papers’ printing schedules. So I would stay up late and watch an hour or so of the match, go to bed, wake up in the morning in time to hear the very end of that day’s play and a bit of discussion from the commentators, and wander downstairs to look at the newspaper, which would have reports on the play which had ended the previous morning. So it was effectively a full 24 hours out of date. And although I understand why it was a day behind, it still felt ludicrous: like picking up the paper on a Monday and finding reports about the football from the previous weekend instead of the one which just finished. In the case of Egypt, of course, it’s not the time difference, just a highly unstable situation. I have been following it with a great deal of interest and mixed emotions throughout the day, following the live blogging and TV coverage from the Guardian, the BBC and Al-Jazeera online. And when I wake up in the morning, the idea that I would turn to the newspaper for news just seems ridiculous; I go straight to the computer to check what’s happening. This isn’t something new, of course; newspapers haven’t been the place to go for fast-breaking news stories since the invention of the wireless, and their position has been steadily eroded by television, then 24 hour news channels and eventually the internet. But it seems so stark now; I read the paper every day, but I’m more likely to get breaking news from Twitter. That’s despite the fact that I actually like newspapers. I like having something lying around the house which I can pick up and browse through while I eat a sandwich. I read the columnists, I might do the crossword, I check the TV listings, maybe look at the film reviews. I will even read the news coverage, I just don’t do it expecting to be surprised. I don’t particularly relish the idea of iPad* newspapers, even though it is clearly the obvious technical solution. I like paper newspapers. You can scribble notes on them, use them with sticky fingers, spill things on them, and split them into sections so that more then one person can read them at once. They don’t weigh much, and you can discard them when you’ve finished with them. But they don’t fulfil the same role they used to. One way or another, they’re going to have to adapt to that. If they want to be at the cutting edge of hard news journalism, they have to be electronic. If they want to survive as paper objects… well, that’s the difficult sentence to finish. And if they want to keep making money? That’s anyone’s guess. One thing I would say is: I’m not pessimistic about the future of news-gathering. Just the future of newspapers. There is a line of argument that, if newspapers can’t find a way to make money in the digital age, it will be a disaster, because we need journalism and someone has to pay the journalists. Now, despite the frequently revolting behaviour of the British press (i.e. 1 2 3), I do strongly agree that we need journalism. I have been glued to the coverage from Egypt and I admire the people who are willing to go out into the chaos to bring back that news. Newspapers are part of that; and I don’t claim to know what would step up to replace them if they all went bust tomorrow. So this is a statement of faith, to some extent. But I just don’t believe that a technology which makes the distribution of information easier than ever before in human history is going to have the net result of reducing the amount of information available to us. * or, you know, whatever non-Apple device eventually emerges as serious competition. 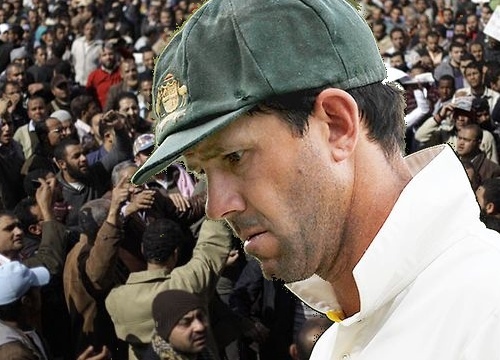 » image: Ricky Ponting, captain of Australia, looks pensive as he considers the situation in Egypt.